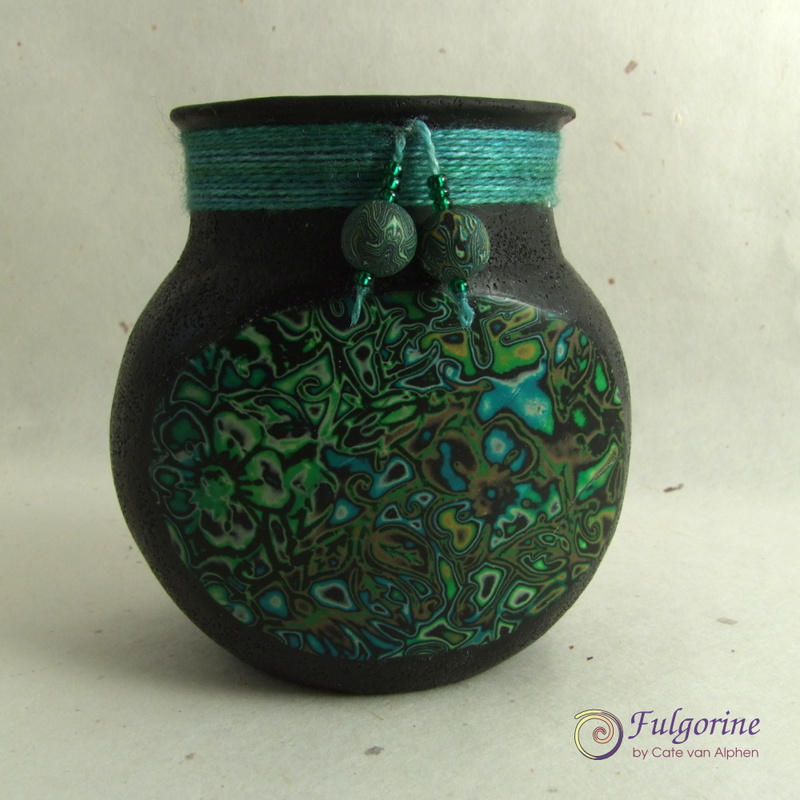 Here is my Art Vessel for week 9 of 2016 Polymer Clay Challenge. Back in week 8, I decided to make a trinket box because I thought it would be a quicker project that I could finish in a week. It didn’t really turn out that way but I’m pleased with the finished box. I decorated it with a white poppy like the one I made for my ring back in November. Perhaps the box is a home for the ring? On the underside of the lid I have written “Love Forgive Understand” with a circle below. The circle is a symbol of the earth, it is a reminder that we all live together so peace (or the lack of it) affects us all. It is also a wish that we learn to love and understand our earth and ask for her forgiveness. I chose to represent the anthers of the flower with wire as a symbol of something hostile and defensive (like barbed wire) becoming life-giving and full of potential (like pollen). For my 2016 Polymer Clay Challenge I have decided to make a vessel each week. I’m planning a wide range of objects from inros to bowls to covered jars so my first dilemma was deciding where to start! Since I had a sheet of mokume gane lying around (as one does), I decided to start by covering a jar you either love or hate ;). 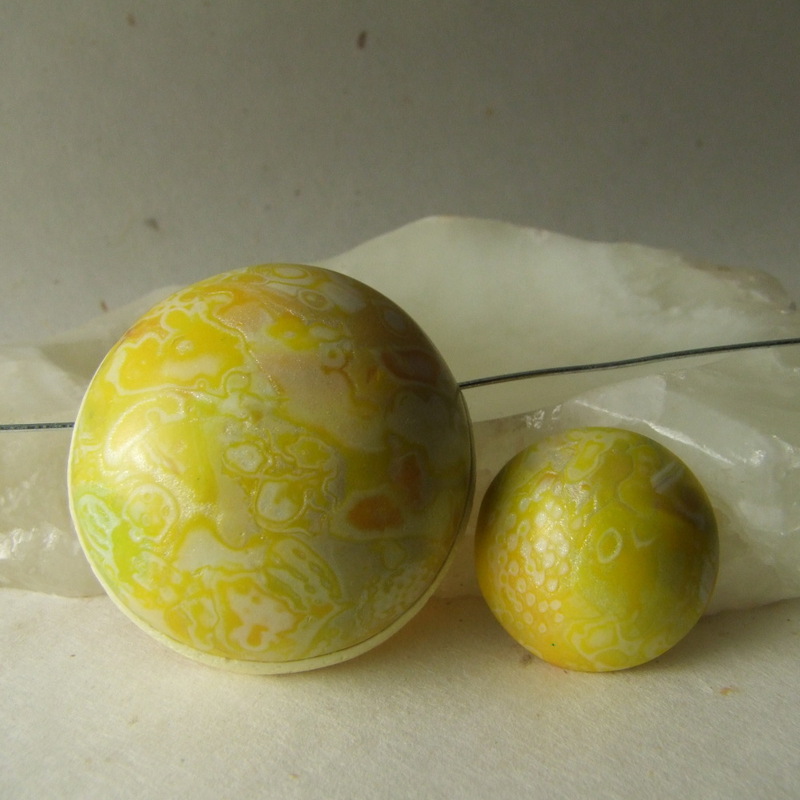 It was already dark glass so I didn’t feel too guilty covering it with an opaque sheet of polymer clay. 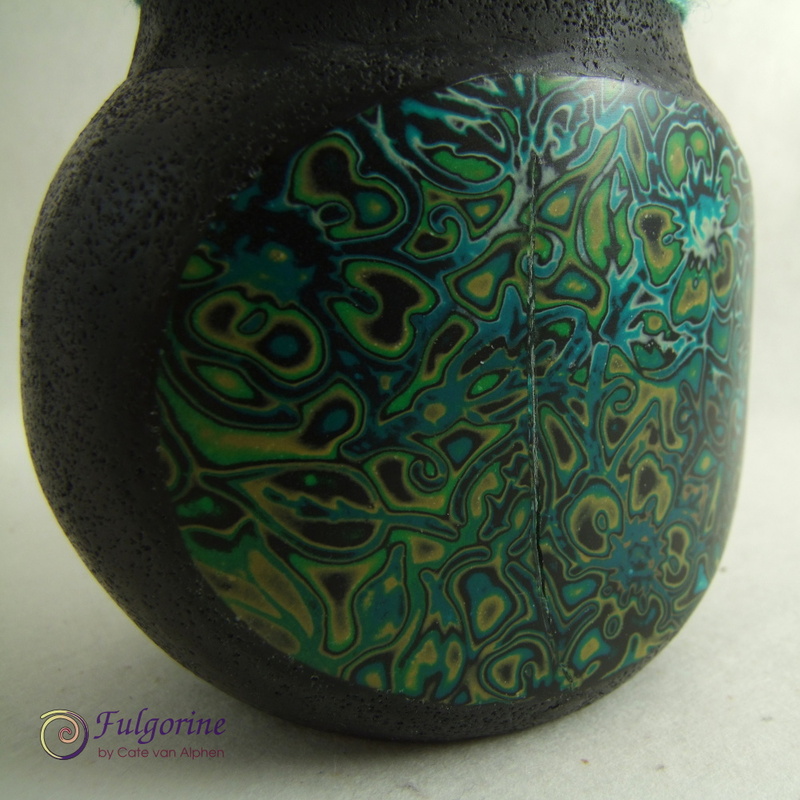 My idea was for it to look like a chunk of lava rock that had been shaped into a vase with a the sides polished off to reveal the bright mokume gane inside. Something almost completely, but not quite, unlike a bolder opal. 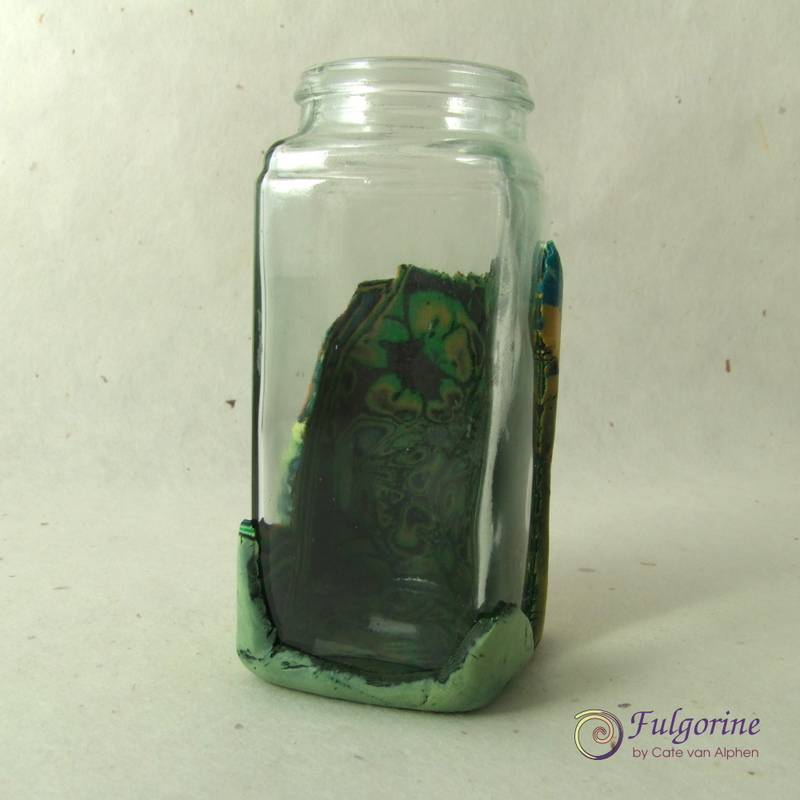 Since this is my first jar, I’m not sure if this is just something that happens when you cover a glass jar with solid polymer clay or if it was because when I baked the patterned sheets I did a part bake as I knew I would be adding more clay and doing further curing. I do have (up to) 50 more* times to practice, but any suggestions to prevent cracks would be appreciated. 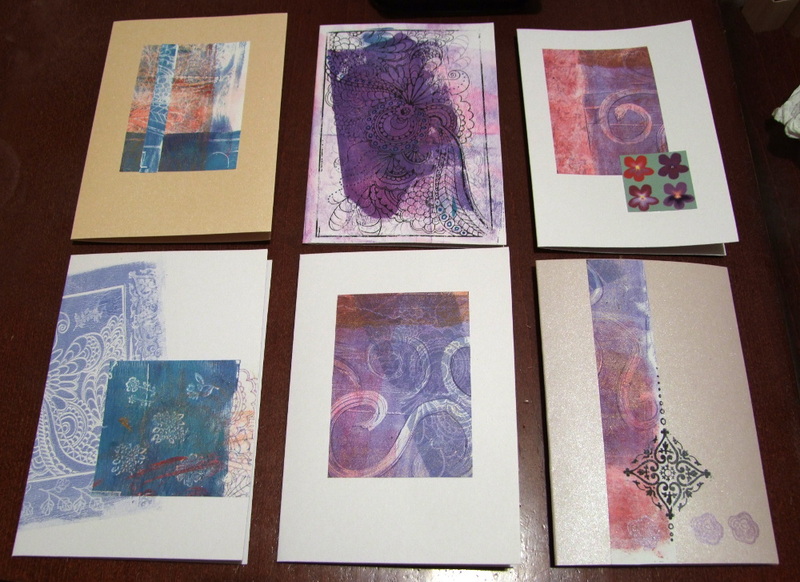 I have started a group on Flickr for Art Vessels if you’d like to join in with your own creations. 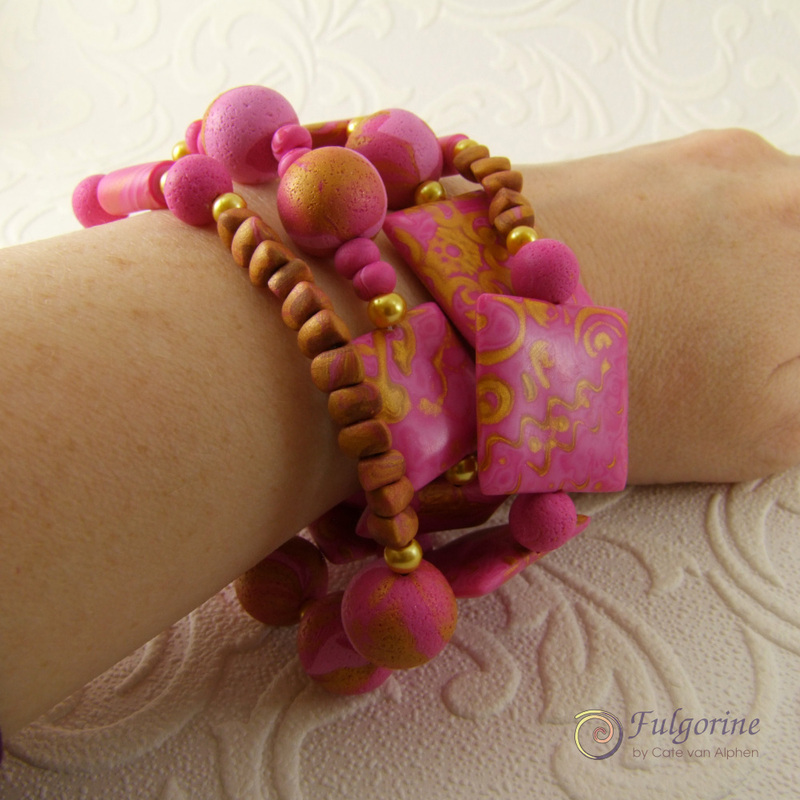 It’s not limited to polymer clay either, just in case you make chocolate tea pots. 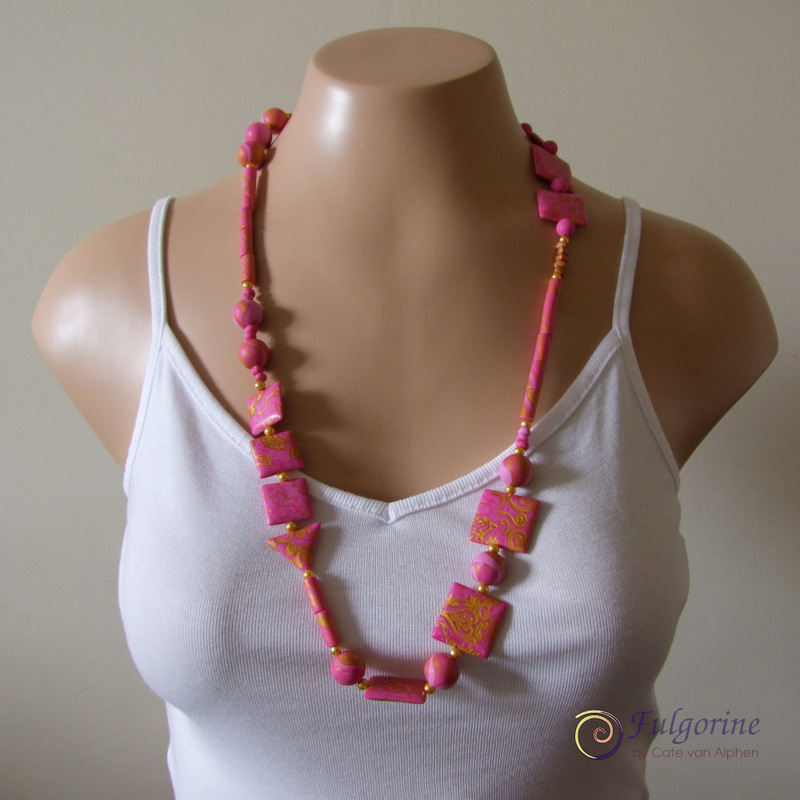 * I am determined to also have a go at making an inro before the end of the year! 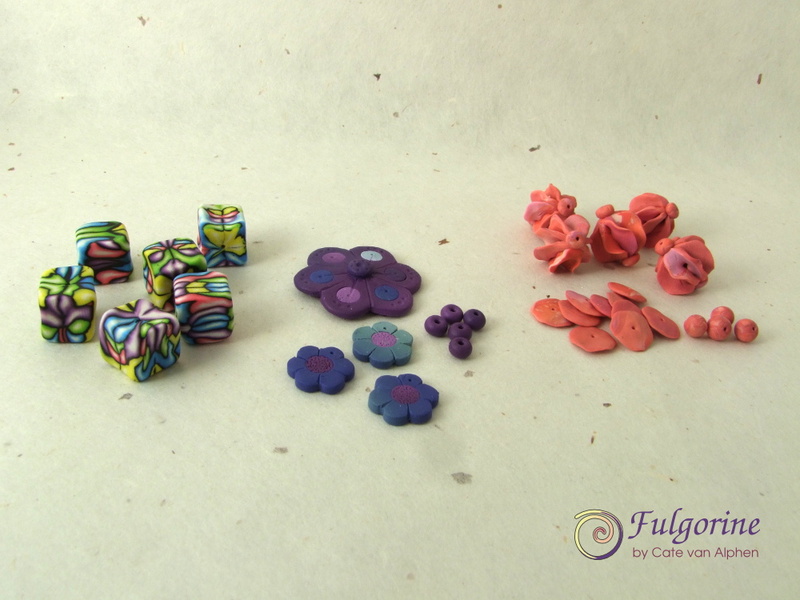 Here are the first red components of my my 2015 Polymer Clay Challenge. 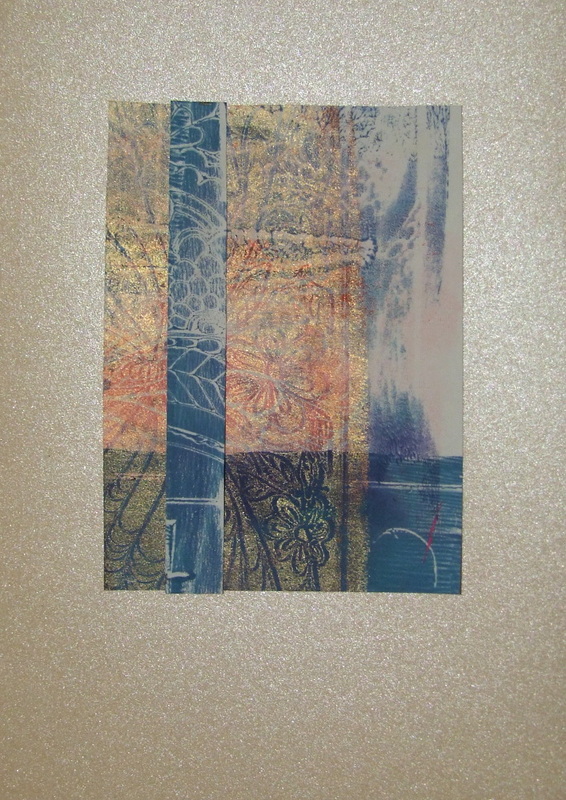 I created the pattern using stamped mokume gane. I had intended to make the cabochons into pendants, but I’ve been struck down with they lurgy, so I’ve been sleeping instead. I textured the moon shaped pendant and sanded the doughnut smooth. I think the texture looks warm and fuzzy – perfect for the current chilly weather. 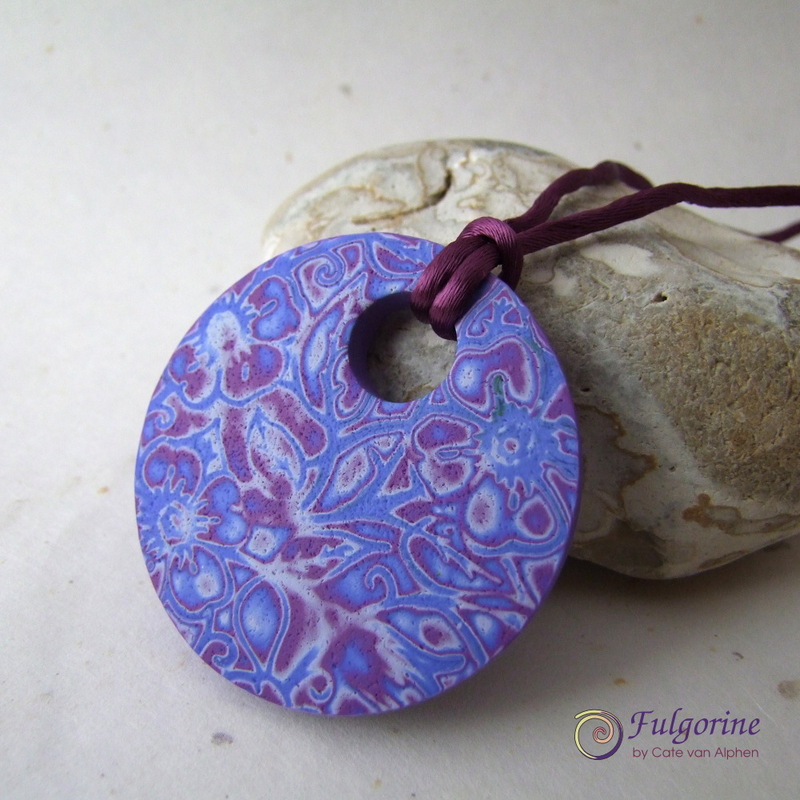 This week I made a mokume gane pendant using my indigo colour palette. This was partly because I’m doing a polymer clay summer workshop next weekend, and I wanted to check I still remembered how ;). I can’t believe that all of a sudden it’s August! 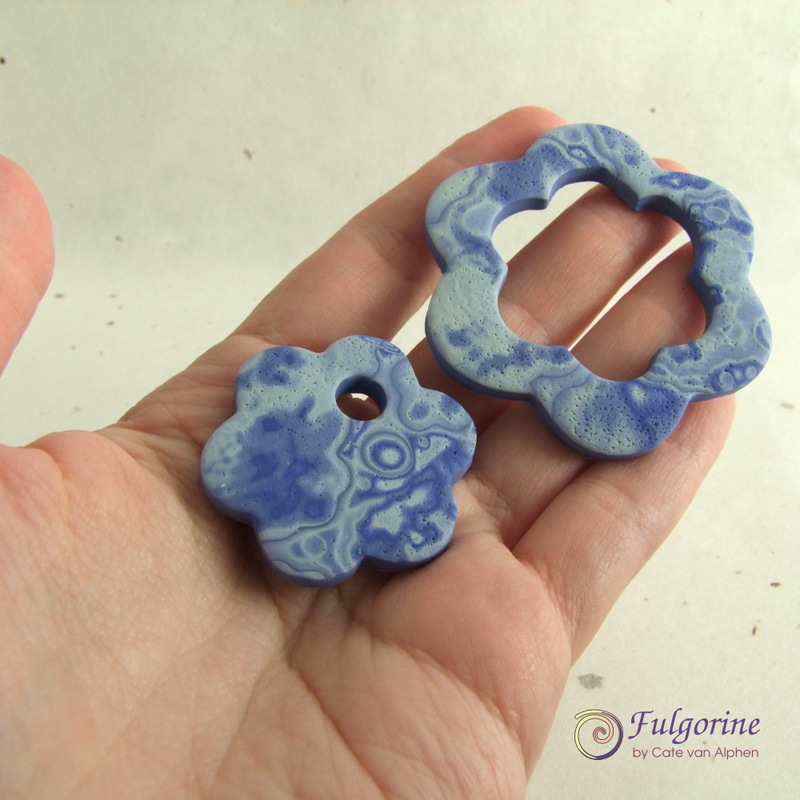 As you can see, I used the shape that I cut out from the larger pendant to make the smaller one. 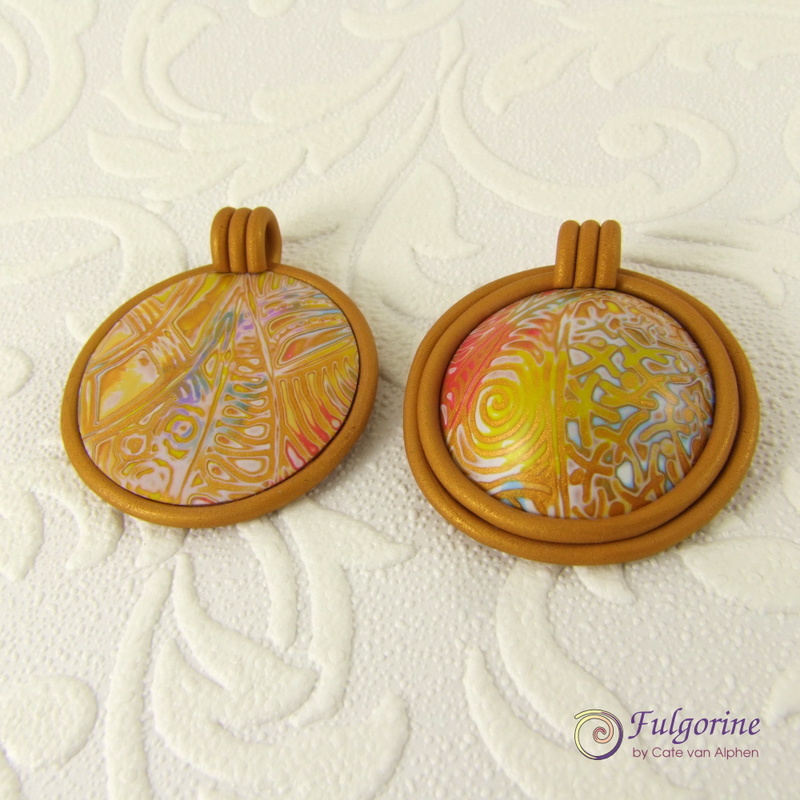 There is similar patterning on both sides so the pendants are reversible. 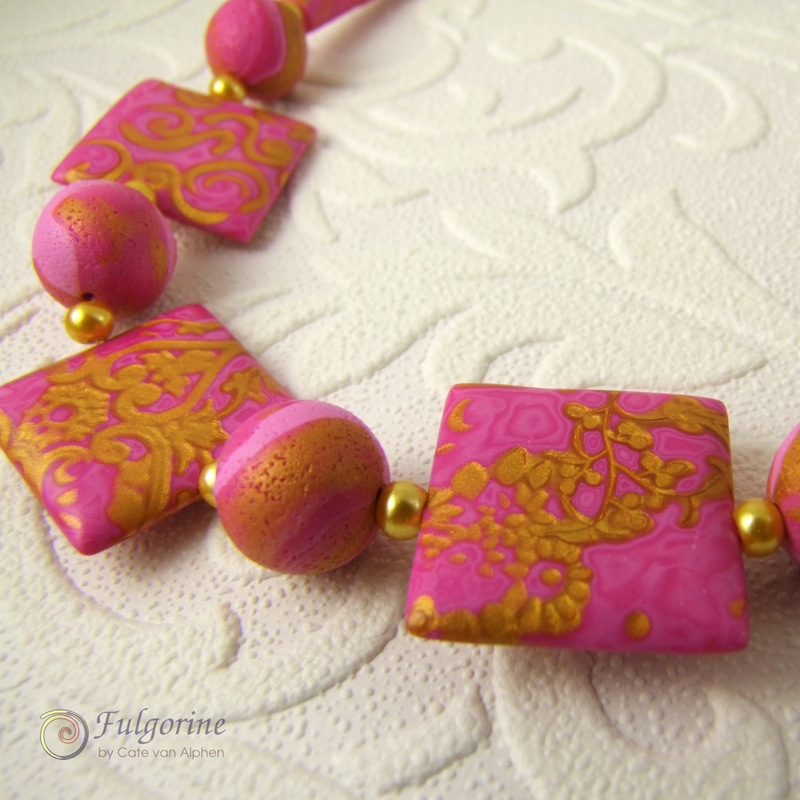 That’s about all I can say about this week’s 2015 Polymer Clay Challenge piece. 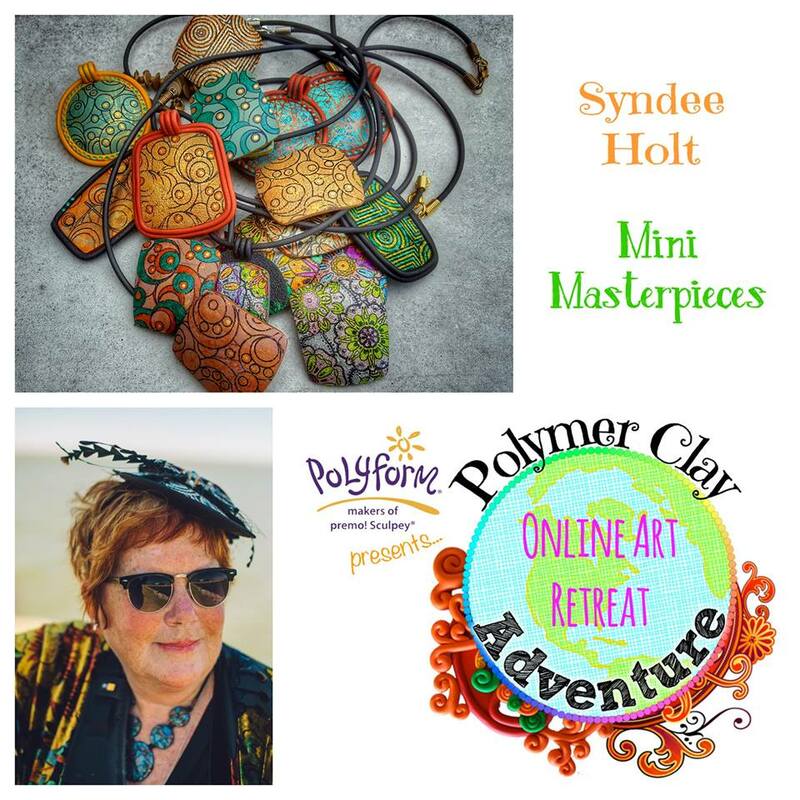 I’m really excited because this summer (15th August) I’ll be teaching an Introduction to Polymer Clay at the Brewery Arts Centre in Kendal. 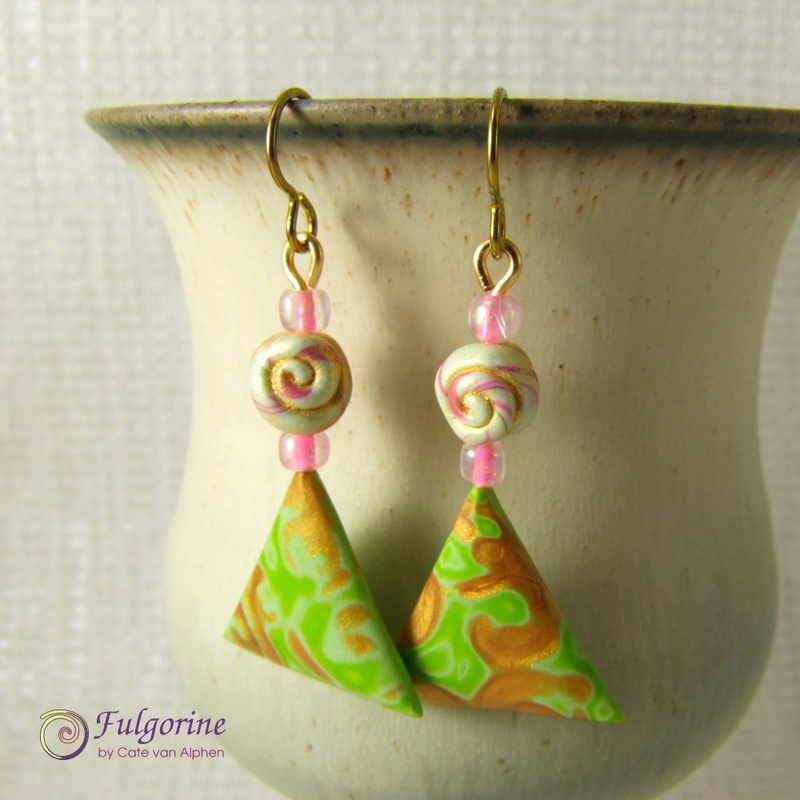 It’s the first polymer clay course they’ve run, so it’s quite a simple mokume gane pendant and earring project suitable for beginners. 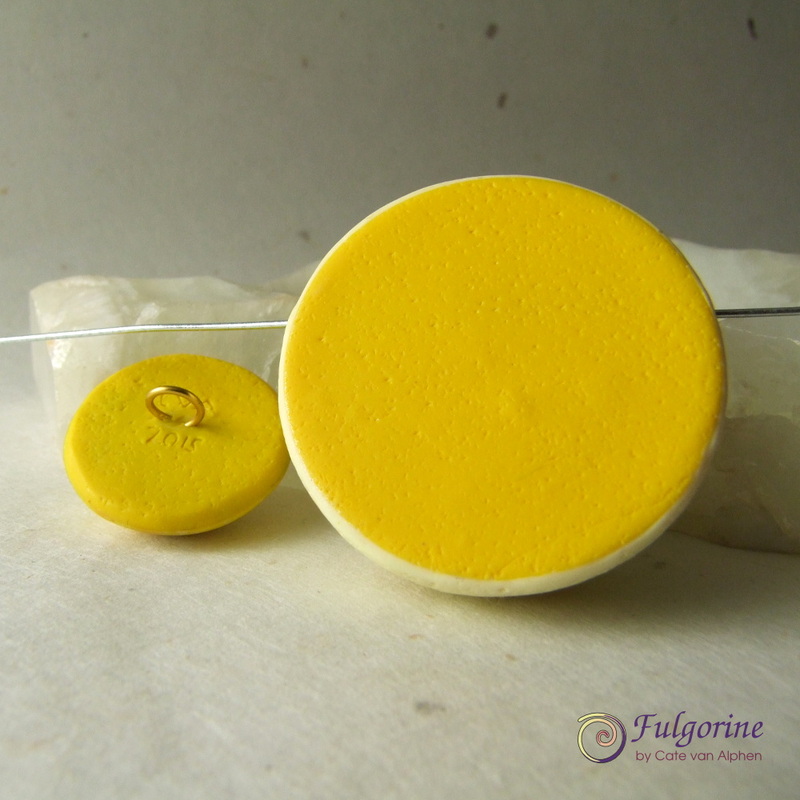 This week I made yellow polymer clay focals. 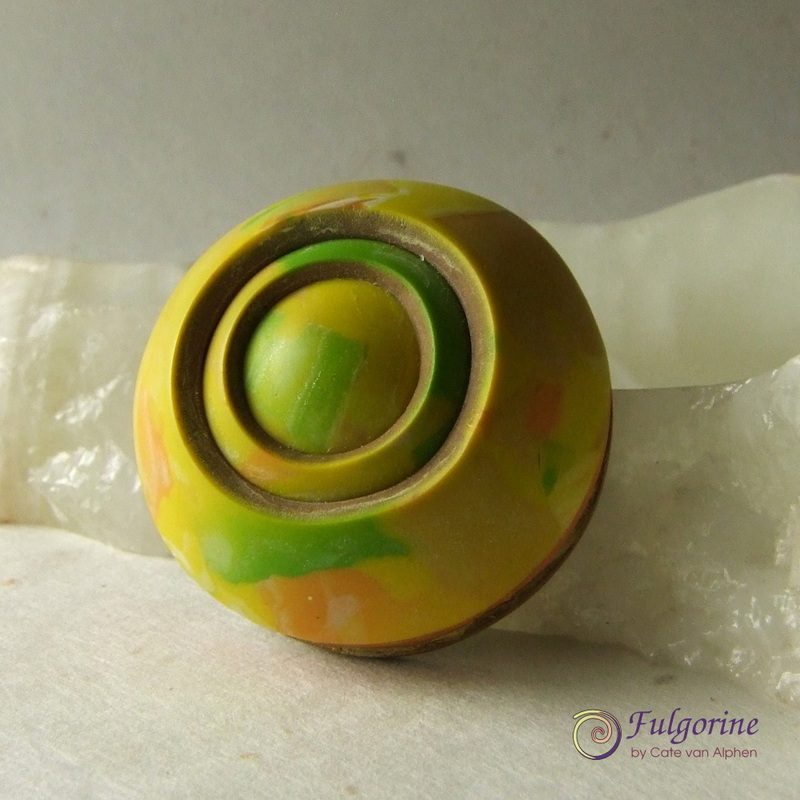 I started off making a domed slider pendant that could also be used as a cabochon in a bead embroidery project. Then I remembered I had timed yellow to this time of year so that I could make daffodils :). 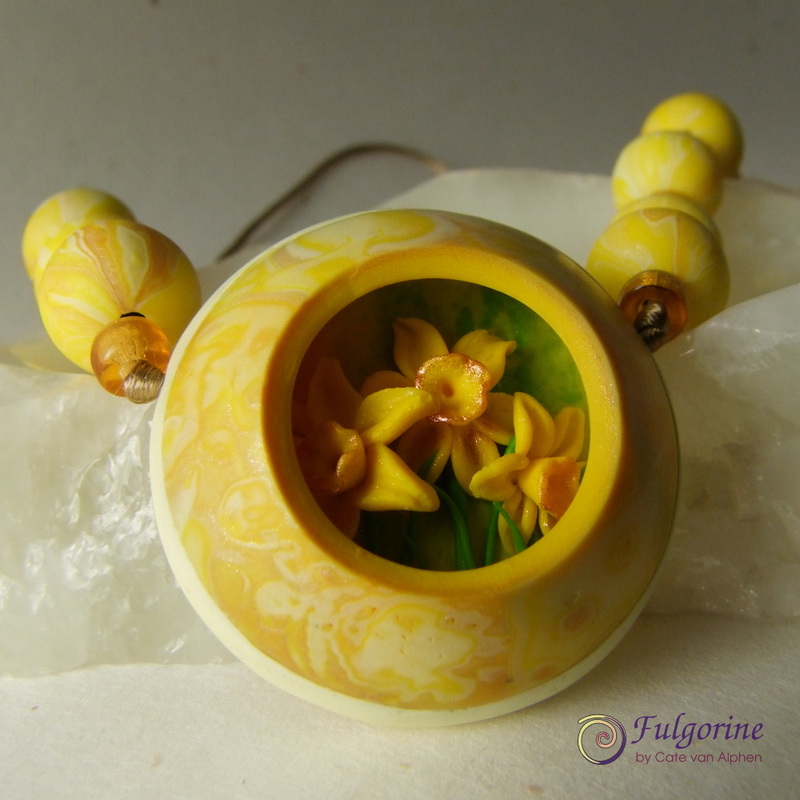 I decided to sculpt little daffodils, and to protect the tiny petals while the pendant is worn, I reused the mokume gane dome idea and cut a window to show the flowers inside. 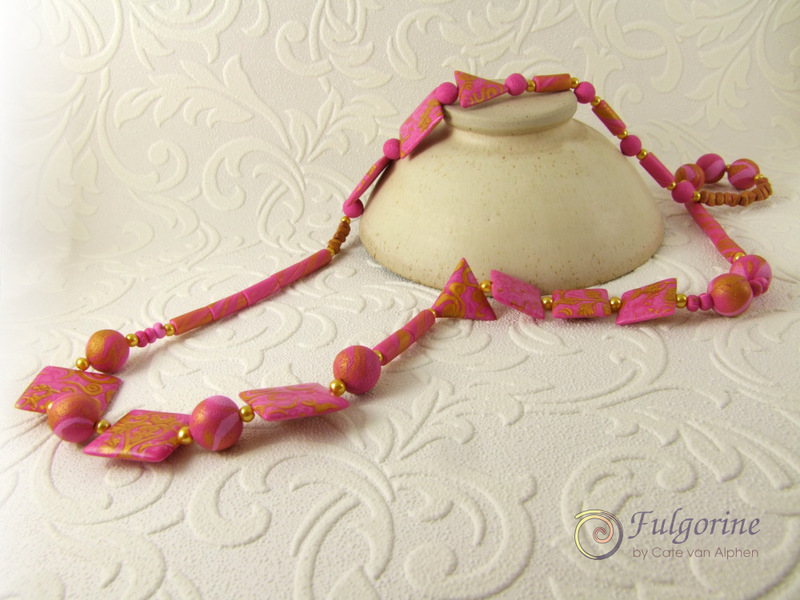 Since I had matching beads from an earlier week, and a shank button to use as a closure (made using the clay from the hole of the dome), I couldn’t resist making a necklace. 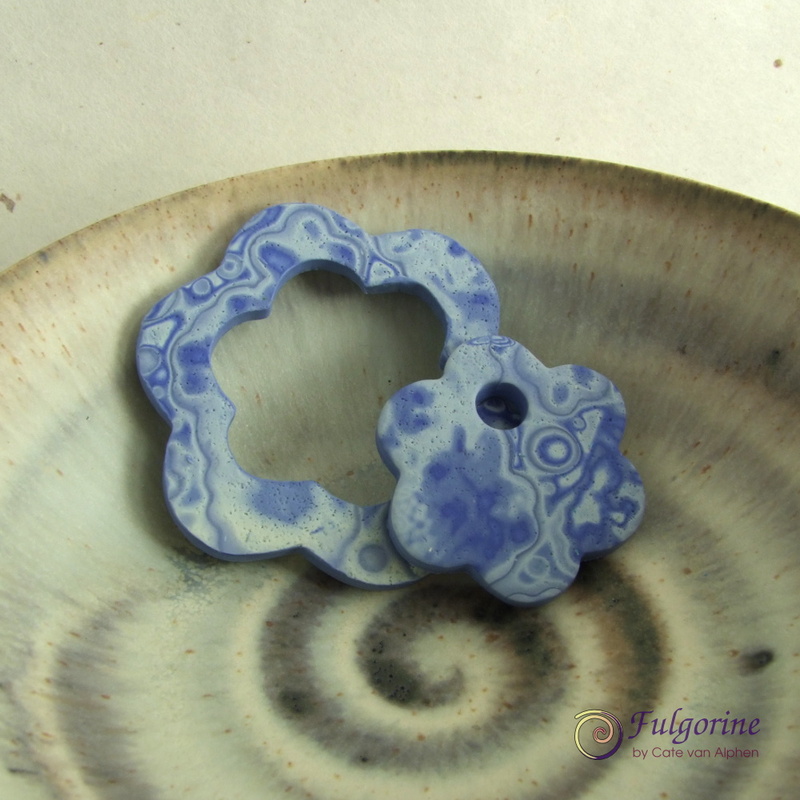 The back of the pendant also has a mokume gane pattern. But that’s not all! 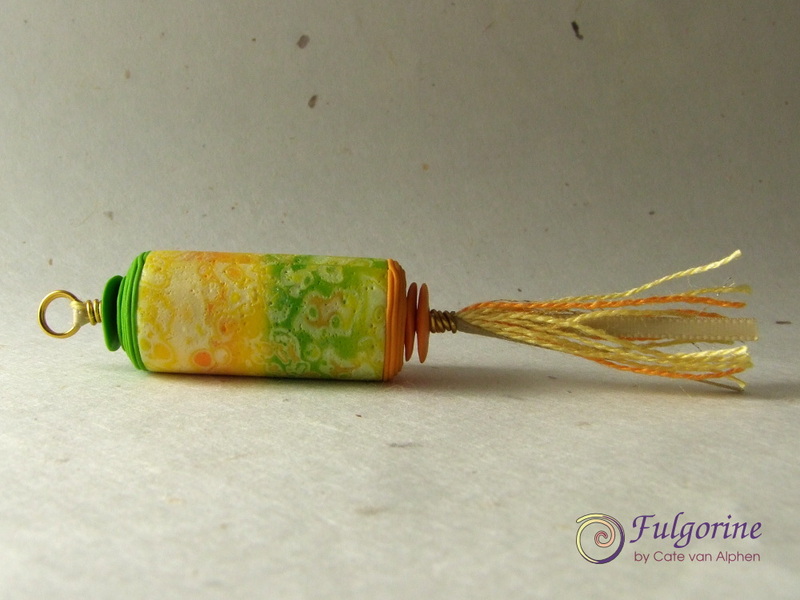 I also made a tassel pendant using a cylinder bead and some of my rustic sequin beads together with silk yarn, satin ribbon and coloured copper wire. The last pendant is a work in progress. I still need to clean off the sanding dust and finish the edging. But I thought it was interesting to show the progression of the dome idea.